AN ACCOUNTING BACKBONE TO BUILD YOUR ENTIRE BUSINESS AROUND. 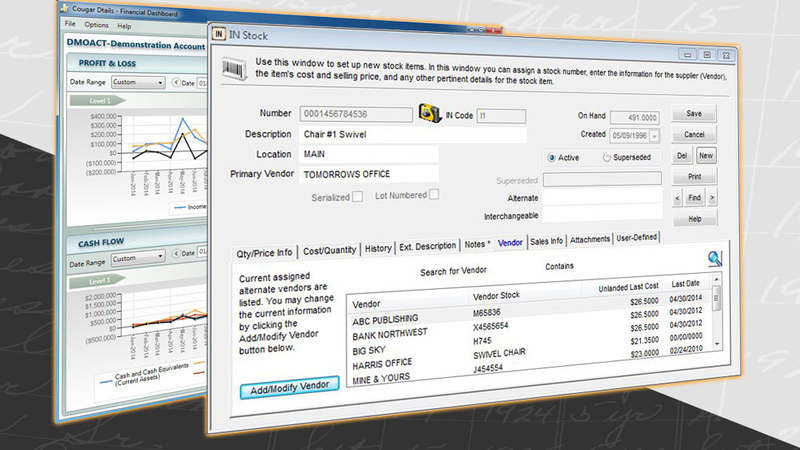 Denali is accounting software as imagined by industry experts. Think customizable software that can serve a 50-person accounting department as easily as be adopted by a 4-employee business (if those colleagues have VERY different performance concerns). Cougar Mountain Software’s on-premises Denali platform automatically inherits the security of a company’s internal network. With individualized admin rights and Denali’s industry-defining audit trail, no transaction, entry, or deleted behavior can be erased or hidden. Fraud has never been less of a threat. Account activity cannot be deleted or hidden thanks to Denali’s secure audit trail. Fraud and embezzlement have never been less of a threat. Denali’s modular design allows your business to purchase ONLY the programs you need. No more bundled tools collecting dust or hoarding space on your server. No more expensive upgrades either. Denali Payroll does not charge extra for additional employees. Cougar Mountain Software believes supporting unlimited employees in Payroll is an obvious investment in the future success and profitability of our customers. Denali provides clear, custom reports in as few clicks as possible. Users build the necessary templates ONCE, and the software will save, maintain, and update that data into perpetuity. The result is transparent, always-up-to-date information. At-a-glance dashboards with real-time charts and graphs to show your important KPI. Intuitive budget tracking and reports any way you want them. Compounding all those strengths is Cougar Mountain Software’s unrivaled customer service. No matter what you do, what you want to avoid, or what steps you’d like to improve, you can trust Denali. This is The Accountant’s Accounting Software. Experience Denali Business for yourself in a personalized live demonstration.